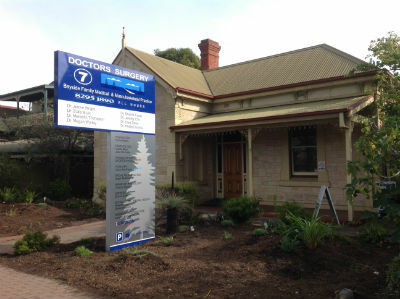 We are located in Glenelg, South Australia. Contact Bayside Family Medical & Musculoskeletal Practice today. The Practice has parking available for 8 cars including 1 disabled car park. Our car park is accessible at the rear of our premises and entrance is off Scott Street. There is no parking along Brighton Road. Alternatively there are many free 3 hour car parks along Anzac Highway and Augusta Street. Parking is also available free for 2 or 3 hours at the Bayside Junction Shopping centre or even for longer periods at a cost. For cyclists, the Practice has several bollards that enable bicycles to be locked in our car park. The Glenelg area is well serviced by public transport. Buses 167, 168, 190, 262, 263, 265, 300 and H20 all service the area from various locations. Please consult Adelaide Metro for timetables and routes. Stop 22 on Brighton Road is directly in front of the Practice. However this is not serviced at all times (consult the timetables) so Stop 23 by Bayside Junction Centre is the alternative. Stop 21A on Anzac Highway. Stop 21 or 21G on Gordon Street. In addition the Glenelg Tram is available with the closest stop being Stop 15 on the corner of Brighton Road and Dunbar Terrace. All of these are within 5 minutes’ walk from the Practice. If you phone us when the practice is closed, you will automatically be put through to Locum Service who will look after you and your family.